Jerry Rice grew up in Crawford, Mississippi, the son of the brick mason. He developed his hands while working for his father by catching bricks that his brothers threw him. Rice later recalled that working for his father also taught him “the meaning of hard work.” His speed also helped him excel in football in high school. Rice attended Mississippi Valley State University, becoming a standout on the football team. He acquired the nickname World, because there wasn’t a ball in the world he couldn’t catch. In college, he had a total of 51 touchdown catches and averaged 10 catches per game in 1984 – the season where Mississippi Valley State averaged over 59 points per game. In that same season, he was named an AP All-American. The school later named its football stadium Rice-Totten Stadium in honor of Jerry Rice and quarterback Willie Totten who threw Rice his many touchdown passes at MVSU. Rice was drafted by the 49ers in the first round of the 1985 NFL draft (16th overall). He struggled in his first season with the 49ers as he learned their system, but by the 1986 season, he caught 86 passes and led the league in receiving yards (1,570) and receiving touchdowns (15). The next season, he set the NFL record for touchdown receptions with 22, a feat made even more astonishing because the season was shortened due to a players’ strike. Rice became one of the biggest receiving threats in the NFL, receiving touchdown passes first from Joe Montana and then from Steve Young. Those tandems helped the 49ers win three Super Bowls in Super Bowls XXIII, XXIV and XXIX. In 2001, the 49ers released Rice because of salary cap problems and he was quickly picked up by the Oakland Raiders. Rice, even at the age of 39, continued to excel, having his 13th and 14th 1,000-yard receiving seasons and scoring his 200th touchdown in 2002. By 2004, however, Rice’s role with the Raiders was diminishing as the team became focused on developing their younger receivers. Rice had only caught five passes for 67 yards for no touchdowns in the first six games with the Raiders, and his streak of consecutive games with a catch had ended. He requested a trade to a team that would give him a more significant playing role and on October 18, 2004, Rice was traded to the Seattle Seahawks for a conditional seventh-round draft pick. After a season that saw the Seahawks become the first team to lose a playoff game to an 8-8 team, and Rice was without a catch in the game, the Seahawks released Rice at his own request. Rice has scored the most touchdowns in NFL history, and holds virtually every significant career record for receivers, including receptions, yards receiving, yards from scrimmage, all-purpose yards, touchdown receptions and consecutive games with at least one catch (which ended at 274 on September 19, 2004 in a game against the Bills). He has also been voted league-wide Most Valuable Player and Super Bowl MVP in Super Bowl XXIII. He has also been selected for the Pro Bowl 13 times. Do you want to hire Jerry Rice? Directly request a quote. In 48 hours we can send you the availability of Jerry Rice If you would like to book Jerry Rice, Entertainment Booking Agency is the right place. 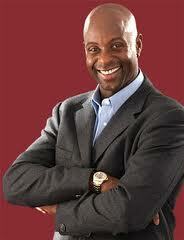 We will offer you the best price and contact the management or we directly contact Jerry Rice. For corporate appearances or speaking engagements you can contact our agents and the will help you true the process. Tags: hire Jerry Rice, Jerry Rice booking, book Jerry Rice, Jerry Rice appearances, find more information on booking Jerry Rice for appearances, Jerry Rice speaking engagements, Jerry Rice endorsements/spokesperson, Jerry Rice appearance fees, Jerry Rice booking agency contact info, biography of Jerry Rice, Contact an artist booking talent agent find a speakers bureau that can book Jerry Rice, speaker booking agency for Jerry Rice, Jerry Rice booking agency, Jerry Rice booking for corporate event. EBA is one of the biggest entertainment booking agencies in the World. We book hundreds of celebrities, artist, athletes and speakers in a year. Important to know is that we are not claiming to be the management of Jerry Rice. We are not the official agent for Jerry Rice. Companies from around the globe book these artists and speakers true our company be course we have one of the biggest networks and we always have direct contact with the artist or the management. We help you to find the right celebrities for your corporate of private events. Please contact one of our agents to get free advice and we will help to get the world-famous artist on your party.